So, as you see in this post's title, the "Tea time" pillow my mother asked me to make for a friend of hers is already packed and sent off with the best courier man (my dad) to the (hopefully) happy recipient. I think it turned out OK, I really like the color combination, and the patterns combination. The pillow form measures approximately 45X45 cm (17''x17''), and the cushion's finished size is 42X42 cm (16,5''x16,5''). On the back side there is a little tag (Natural Style Handmade)..ohhh I love those little details... If only I could take better pictures so you could see it better!!! 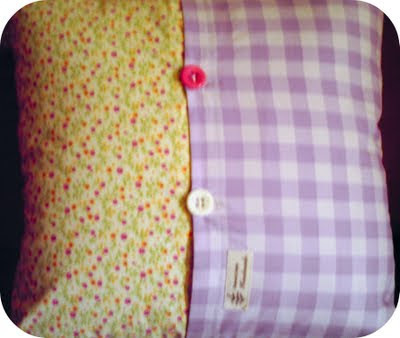 Now, off to the next part of the challenge the Sprocket pillows !!! I'm so anxious about this... it seems to me like a huge project. I don't even know if I have enough fabric, how I will make the color/pattern combinations... ooohhh I'll breath in breath out, breath in breath out.. and I'll jump right to it!!! p.s. I forgot the most important part!!! How silly am I!!! Kyla over at Funky Polkadot Giraffe has started a craft bookmark challenge. 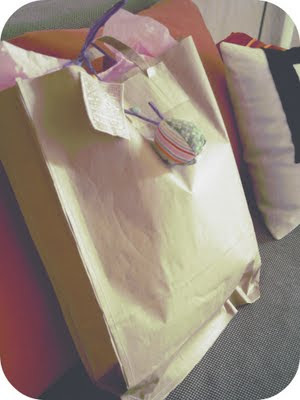 All you have to do is make something from your bookmark list and present in on her cute blog on April 28th. So, what do you say?? Are you challenged?? I do love the colour combination! and the tea pot is beautiful, did you design it yourself? I'm sure your mums friend will love it! i know I would :) we should do a trade or something? Very cute pillow! And on top of that, you resewed a bag!? You go, girl! Ohhhh that's so sweet!! I love it! Came from Mom's online garage and am following you now. I just love your blog! 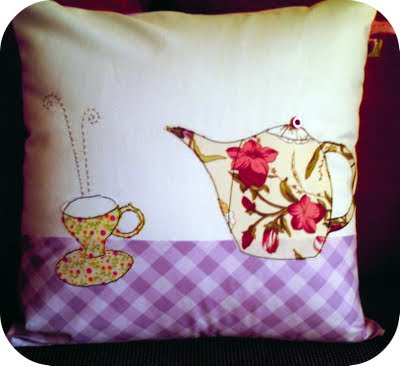 That pillow with the teapot is adorable-great job! 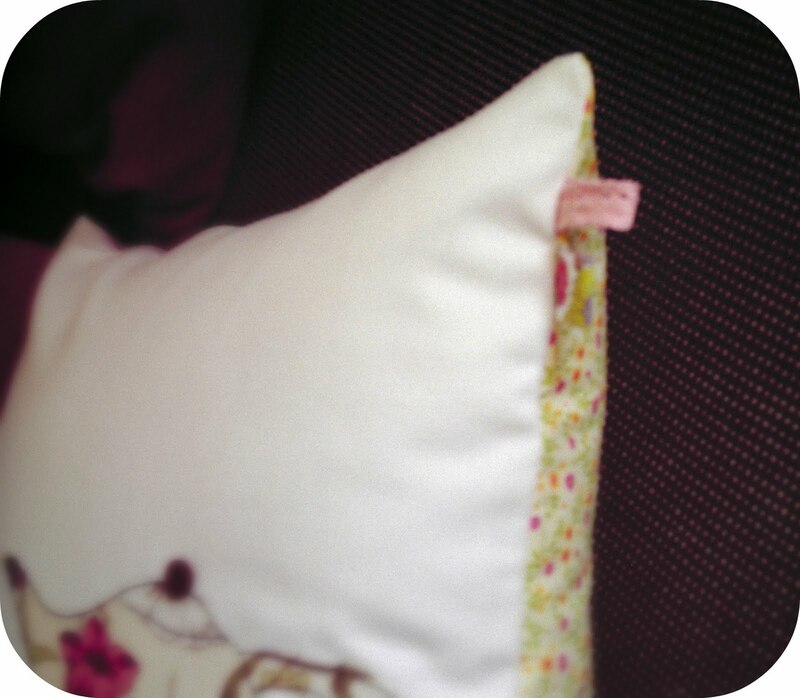 This cushion is so lovely! That pillow is gorgeous! You did such a great job on the applique. Enjoy it! The pillow turned out great! I love the little details like the stitching above the teacup and the buttons. Lovely packaging too. I just found this post! I LOVE it! I am a nut for anything with tea pots and this is just PERFECT!! Love, love, love it! That is one cute pillow! And the back is just as cute as the front.